EDITOR’S NOTE: It doesn’t come any crazier than HYIP prime-bank schemes. This is another example . . .
OCWeekly, a publication in Orange County, Calif., first reported the news of the Onciu guilty verdicts on Oct. 24. PonziClawbacks.com picked up the story on the same day. How things will proceed at Allied Petroleum is unclear, given that Onciu was indicted in 2008 as part of what federal prosecutors called an “undercover investigation into fraudulent high yield investment schemes” and now has been found guilty. As part of the sting, the FBI created an “undercover entity (UCE) in Newport Beach, California that purported to be a financial advisory firm,” according to the indictment. Undercover agents posed either as “partners of the UCE seeking to invest their own funds or as wealthy clients of the UCE seeking to invest substantial monies,” according to the indictment. Onciu, meanwhile, told an undercover agent during a conference call in December 2006 that he “usually doesn’t do transactions of less than $100 million” and that “making a return of 100% a month is not abnormal,” according to the indictment. With an undercover agent on the line, Onciu asserted that his role was to provide the required “humanitarian element” and that the “program is highly confidential and the government does not want people talking about such programs,” according to the indictment. Onciu also offered to reduce his fee, as a means of inducing the undercover agent to join the program, according to the indictment. 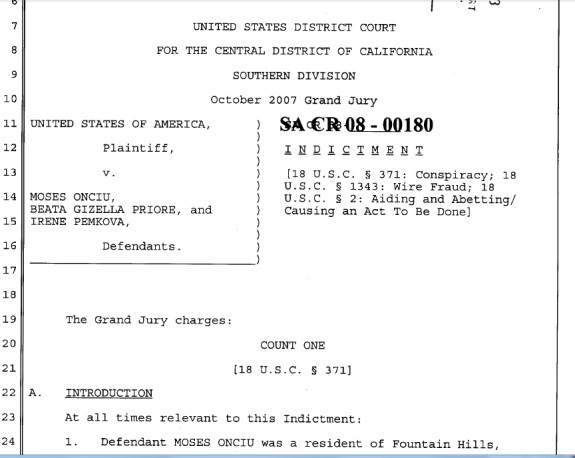 During the same 2006 time period, Onciu co-defendant Beata Gizella Priore of Glen Head, N.Y., spoke on the phone with an undercover agent and purported to be in Europe, according to the indictment. Priore told the agent that a “client of hers invested $1 million in the program and made a return of $6.5 million,” according to the indictment. Priore, who has pleaded guilty, later had a personal meeting with the undercover agent. Among other things, New York resident Priore asserted she was “calling from the trading group in Frankfurt,” had been in the HYIP business for seven years and that the “program required a minimum investment of $1 million,” according to the indictment. In the Nov. 4 web post, Onciu appears to be claiming that Priore’s surprise guilty plea in the 2008 HYIP case undercut his defense and that Pemkova created a false narrative that he was a CIA operative, thus subjecting him to the conspiracy charge. The post did not explain Onciu’s take on the allegations that he’d offered an undercover agent a discount to join the program and apparently decided that, in this instance, he’d accept less than the $100 million usually required to do business with him. Nor did the post explain how making a return of 100 percent a month in a secret HYIP program that required a humanitarian element was not abnormal. “Although I was only the introducing party I was charged as a co conspirator in this case and ultimately was the only one tried due to the other two parties legal standing: one took a guilty plea for a reduced sentence and the other took an insanity plea, leaving me as the only defendant,” the post read in part. He’s hoping no one has any idea how the legal system really works. Thank you for this, SD.